The supplier assessment at PERI is a simple tool for the general evaluation of the performance of our suppliers. A structured and standardized process for the evaluation of suppliers helps us to detect improvement potential at an early stage and to counteract in time problems arising from bad supplier performance. All suppliers are evaluated in a standardized way throughout the company according to objective and exclusively quantitative evaluation criteria. Through this, the individual results of our supplying partners are presented in a transparent and objective manner. The focus is placed on suppliers with good results – but also suppliers with deficient performance are asked to improve by setting concrete goals. The definition of the assessment criteria was deliberately kept in a manageable manner. As important components of our partnership, here first of all the main criteria of quality and logistics are considered for the assessment. All required data for this can be clearly and objectively taken from our systems as ”hard facts“. The assessment is carried out with a point system. The range of points reaches from 0-100 points, with 100 points being the most positive assessment. Points are not allocated in a linear way so the points cannot be compared with percentages and do not describe the pro rata degree of fulfilment. The allocation of points was considered and weighted individually for the criteria. This means that severe deficiencies can lead to the deduction of many points and that unimportant deviations might lead to no worse assessment. For evaluating the quality, the main aspect is to check that the deliveries or services substantially meet the contractually agreed technical features (usually the drawings). The fulfilment of the required quality is ranked as being very important for us in the framework of the overall assessment and is thus weighted with 50%. Principally, the quality is checked by Quality Assurance per delivery and entered in the quality system. In case of a deficient performance, a complaint concerning the delivery is triggered and this then leads to a negative evaluation of the quality. All complaints are weighted differently depending on the degree of the deficiency. Here it is very important to gain differentiated results; for example, deficiencies with effects on the safety of the delivered products lead disproportionally to a very bad evaluation – minor deficiencies, such as for example minor packaging errors, only have a minimal effect on a bad evaluation. The sub-criteria ”Delivery“ and “Quantity“ are relevant for the evaluation of the main logistics criteria. 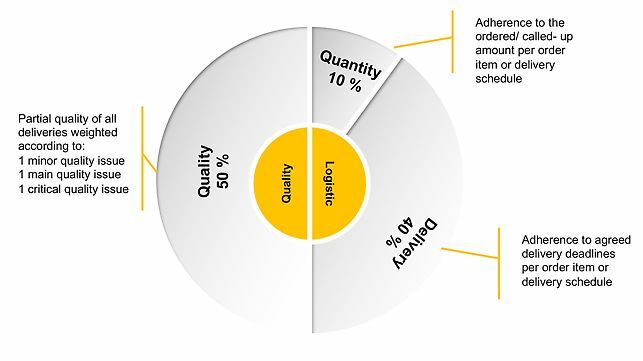 In the overall assessment, the criterion of “Delivery“ is considered with 40% and the criterion of ”Quantity“ with 10%. The review of the contract bases (order) is a very important point in our cooperation. The bases agreed when setting up the contract (among others delivery and quantity) are relevant for the supplier assessment later on. Deviating agreements at a later point, which were asked for by PERI, do not lead to a negative evaluation. We accept a maximum period of 5 days for the contract review until the order confirmation – the regular reaction time, however, should be a maximum of 2 days.